Painted burial pottery from Harappa. The two largest vessels were found in the same burial and are described below. 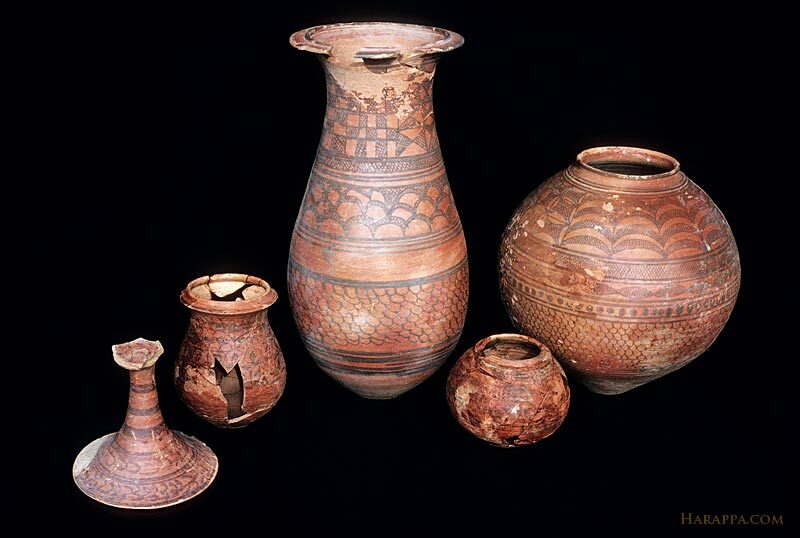 The other smaller vessels were found in an earlier burial and represent an older style of pottery. The rounded base was originally supported in a ring stand. The black painted geometric designs are arranged in panels with a red slip as background. After initial firing, the entire painted design was obliterated with a red slip and fired again at a low temperature that turned the exterior layer of the slip red through oxidation, but the inner layer remained gray. This overslip was not well bonded to the previously slipped surface and was partially eroded when first discovered. After initial conservation and documentation, one half of the overslip was removed to reveal the original painted design. The lid and ring stand with this vessel were also covered with an overslip. This tall jar was located at the foot of the burial pit for burial 148a. Dimensions: jar - 62.8 cm height, 32.4 cm dia. ; lid - 8.9 cm height, 28.2 cm dia. A large globular vessel with lid and ring stand (no. 187) was located at the head of the same burial. It was made in several stages, beginning with a molded base and then built up in two or three stages on the wheel. Other unslipped vessels were associated with these two uniquely treated burial vessels. With geometric designs arranged in panels, and found in the same burial (148a) as the tall painted jar (no. 186), this vessel also had a second layer of red slip that totally obliterated the painted design. The same treatment was done to the lid and ring stand. This large pot was made on the wheel in several stages and has a molded base. The lid was made in a mold on the wheel and then the knob was attached, also on the wheel. The ring stand was thrown on the wheel and then carved to hollow out the base. Dimensions: pot - 44.4 cm height, 43.8 cm max dia. ; lid - 6.6 cm height, 22.5 cm dia. ; ring stand - 12 cm height, 20.2 cm dia.